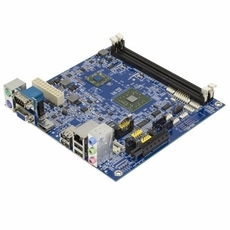 The VIA EPIA-M850 Mini-ITX board pairs the latest 64-bit VIA Nano E-Series processor with the VIA VX900H media system processor creating the most complete platform for commercial embedded multimedia and media center devices. The VIA EPIA-M850 board features a choice of VIA Nano E-Series processor, available in both 1.6GHz and fanless 1.2GHz SKUs. The VIA Nano E-series is leverages the VIA VX900H MSP to support up to 8GB of DDR3 system memory. The VIA VX900H features the latest ChromotionHD 2.0 video engine, boasting comprehensive hardware acceleration for the latest VC1, H.264, MPEG-2 and WMV9 HD formats at screen resolutions of up to 1080p without incurring a heavy CPU load. Display connectivity support includes onboard HDMI and VGA ports with pin headers for dual channel 24-bit LVDS. Rear panel I/O includes a Gigabit LAN port, PS/2 support, a HDMI port, a VGA port, four USB 2.0 ports, a serial port connector and three audio jacks. An on board a PCIe x4 slot is accompanied with pin headers providing dual channel 24-bit LVDS support (including backlight control), an additional three COM ports, a further four USB 2.0 ports and one USB device port, LPC support, Digital I/O, SPDIF out and an SMBus header.